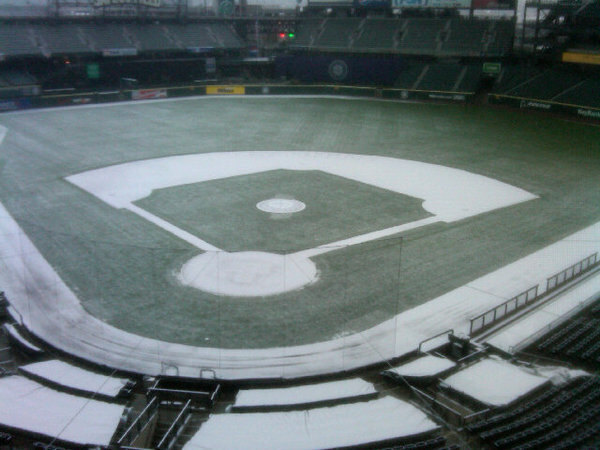 This may amuse fans from other cities where snow is more frequent, but the first time I saw snow on a baseball diamond was during the NHL Winter Classic at Wrigley Field last year. It’s so ingrained in me that baseball represents summer, that this is just weird. Plus, Seattle’s not a really big snow city, as evidenced by the ridiculousness of the past 24 hours. Not a lot of news lately unless you’re following the Arizona Fall League, which I haven’t been. I probably should have, because it looks like Dustin Ackley is going nuts down there. I’m glad to hear it. If he keeps it up, we may have ourselves a new second baseman. Since I haven’t been on top of much other than my small contract job lately, I haven’t looked up any numbers, and frankly I’m too tired to do even that right now, so I don’t know how feasible this all is, but according to the article linked above, he’s projected well, and if you’re reading this you are likely already aware of that. Josh Lueke has also been protected from Rule 5, so that’s something of interest. It demonstrates that the organization currently has no intention of letting him out of their sight. I had debated writing about all of that earlier this year, but my male counterparts have managed to write about it enough for everyone, and I just can’t find the motivation to care at this point. I believe in second chances, and Lueke’s a good pitcher. Let him pitch – if he does something to ruin that, then let him be done here; but until then, I have no reservations about allowing him to nestle within our ranks, and it doesn’t seem like any of his teammates do, either. I have heard some talk about Justin Upton being a focal point for a deal lately, but there are also rumors that the Mariners are a no-trade thing for him; then yesterday I heard that that was not necessarily true. I won’t hold my breath. I still believe in Jack Zduriencik’s ninja stealth, so maybe it’s not out of the question, but we seem to be pretty low on the radar lately, compared to other teams who are actively signing players – Rajai Davis, incidentally, is now a Blue Jay, rendering him reasonably harmless to us. I’m glad for anything that helps chip away at our westerly rivals. The Ms mad a minor league deal for Luis Rodriguez, described by MLBTR as a “light-hitting 30 year old”. We need another one of those (yes, that is sarcasm). Jeff Sullivan says he’s OK for the price, so he looks like maybe a guy who will stay in Tacoma or maybe AA, see some time on our bench in the event of injuries in the major league club, and maybe get a call up in September. OK then. Lastly, and this is old news, the Dave Niehaus formal memorial has been planned for Saturday, December 11th. 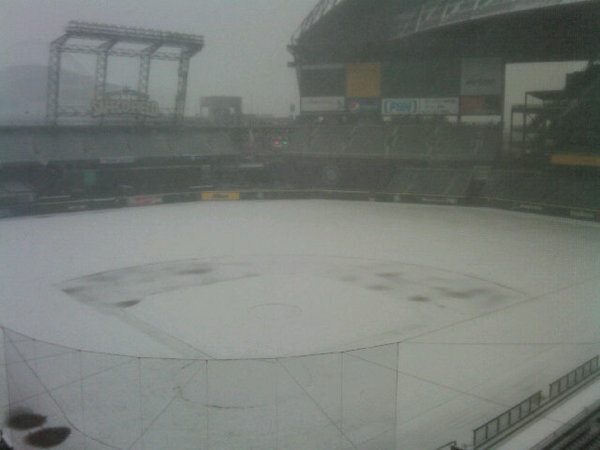 As things are today, sitting in SafeCo in this weather is truly the last thing I want to do, but hopefully our weather will settle down a little in the next few weeks, and a few layers and lots of socks will protect us all for the time it will take to bid Dave a proper farewell. Gates are at noon from what I understand, ceremony starts around 1pm. More details here.